For Prelims: Sharada Peeth- religious significance, location and related facts. For Mains: Significance and outcomes of this development in bilateral relations. Context: Pakistan has given its green signal for Sharda Peeth corridor. The Sharda Peeth corridor, when opened, will be the second religious tract after Kartarpur corridor in Pakistan-controlled territory that will connect the two neighbouring nations. The temple has been completely deserted since Partition in 1947. Travel restrictions on Indians also discouraged the devotees from visiting the shrine. The temple is revered by Kashmiri Pandits among other Hindus across the globe. It was once regarded as a major centre of higher learning of Vedic works, scriptures and commentaries. The temple is also one of the 18 Maha Shakti Peethas, or a “Grand Shakti Peethas”. It is considered to be the abode of Hindu Goddess Saraswati. The temple has close resemblance with the Martand temple (another religious site in Anantnag) in architecture, design and construction style. One of the accounts of construction of the temple says that it was built during the rule of Kushans (early 1st century). While many other accounts say that Buddhists had a strong involvement in the Sharda region, the researchers have not been able to find evidence to support the claim. Academics also believe that Raja Lalitaditya had built the Sharada Peeth for containing the religious and political influence of the Buddhism. The claim is supported by the fact that Lalitaditya was a master of building massive temples. Since partition, the temple has been out of bounds for Indian pilgrims. 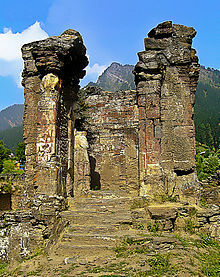 The ancient Sharada temple, as well as the adjacent ruins of Sharada University, are situated in Neelam Valley, which is 160 km from Muzaffarabad, and close to the Line of Control. It is in a small village Shardi where the river Neelam joins Madhumati and Sargun streams.